Finally home from AQS Quilt Week in Des Moines and getting caught up. Free block is posted and newsletter has been sent out. Sorry it was a few days late. Life just gets busy sometimes. after a blow out on the way up to Des Moines. What is up with the cost of tires?? Talk about sticker shock!! And the trailer has 4 tires and a spare. GASP. Gotta tell you we were sure happy we had a spare when this thing blew! 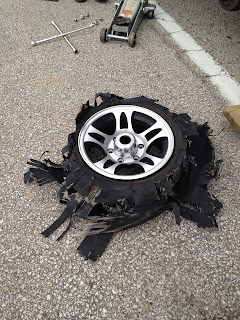 By the time we got 35 feet of camper plus truck stopped and off the Highway there was not much left of this tire. 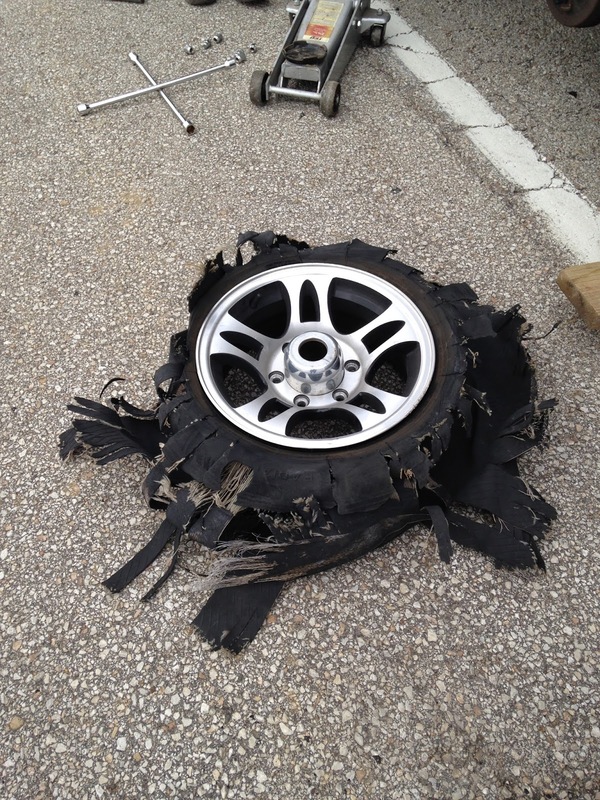 Thank God we were safe and AAA-RV Plus for changing the tire. 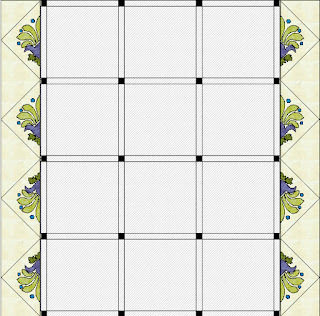 Back home, now I am working on my block of the month blocks, my Camping Row and printing patterns for market in 2 weeks. My camping row is making slow progress. I will post pictures once the applique is in place. right now it is all over my cutting table! I just love this little racoon! Candy Stars is now available on my website for half price in October. It was in The Quilt Pattern Magazine in February and is now available for sale on my website. Another one of my designs, At the Cantina, was in the last four issues of TQPM. The final installment (blue and white borders) is in this month's issue! A year's subscription to The Quilt Pattern Magazine is only $16 and you would get this pattern plus a dozen more each month for a year. It really is a bargain. I have designed a 30's reproduction BOM for them which will be featured all next year. I hope you will tune in for that. I will be offering fabric kits for it as well. The new Deco Gardens block for October is actually the border triangles. You can see how they are placed in the side borders in this diagram. 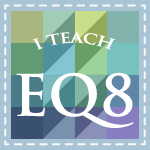 Be sure to download this block for free during October on the 2015 BOM Tab at the top of the blog page. Here is this month's bonus block. You can buy it on my website if you are not a subscriber to my newsletter. I think this might be my favorite block so far, but then I say that every month. 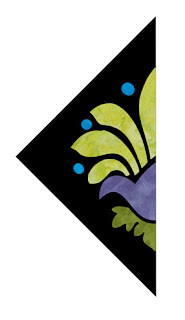 LOL If I could get away with it I would just keep on designing these Art Nouveau flower blocks, because they are so fun. I love them, and I guess a few of you do as well based on the great comments I get from many of you. But I am thinking of doing a pieced BOM next year, possibly a Seminole Pieced sampler. What do you think about that idea? I Would love your suggestions for next year's BOM. 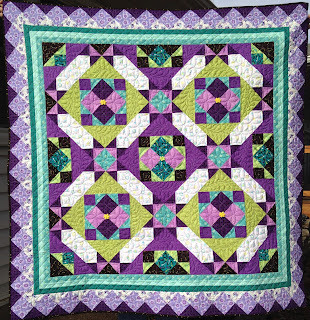 The Arboretum Stars quilt is on my website now. The pattern can be purchased as a digital download. Of course I can't take a picture of a quilt on the floor without a cat showing up and plopping down on it. I had to shoo Buster off 3 times before I got a cat-free picture. I loved making this quilt, I just wish I had not been so rushed to get it completed. I want to try it in other colors and fabrics now. So back to the studio to get my camping row done!! I would enjoy a pieced seminole project. Wow, your tire was shredded to pieces. That would certainly put a crimp in your travels. Buster is precious! He is a fabulous quilt model! Beautiful quilt. I feel your pain on the tires. We took a month-long trip in August in our RV after replacing all six tires for the trip. We had two flats on the second night out in a small town with no place that had tires the size we needed. Thank goodness for roadside assistance. I'd love a pieced BOM. I mostly do appliqué and would love a new challenge. I have been wanting to do a native american quilt for quite some time. Thank you for all the great patterns you make available for us. Traveling with a trailer can be stressful at times. Glad you are safe. Reeze, Help! My husband accidently deleted my newsletter this month before I was able to download my patters for Deco Garden. Can you resend it? Cats on quilts - love it! 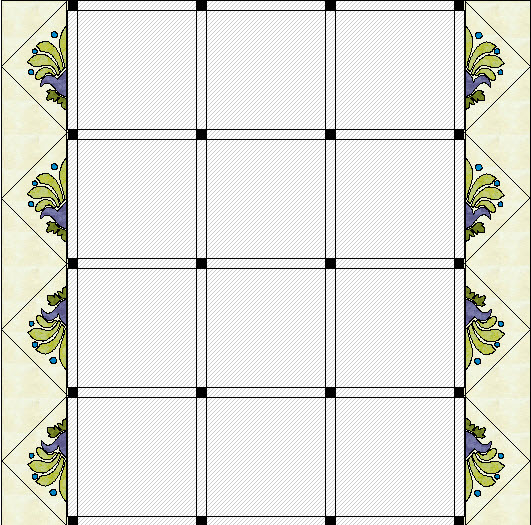 Also love October's three roses bonus block, but can't download it. Newsletter takes me to the blog, so I got the side triangle pattern, but haven't found a link to the bonus....what am I doing wrong??! My vote, is also for Seminole, thanks for sharing!! This month's block is very cool. Well I like it. 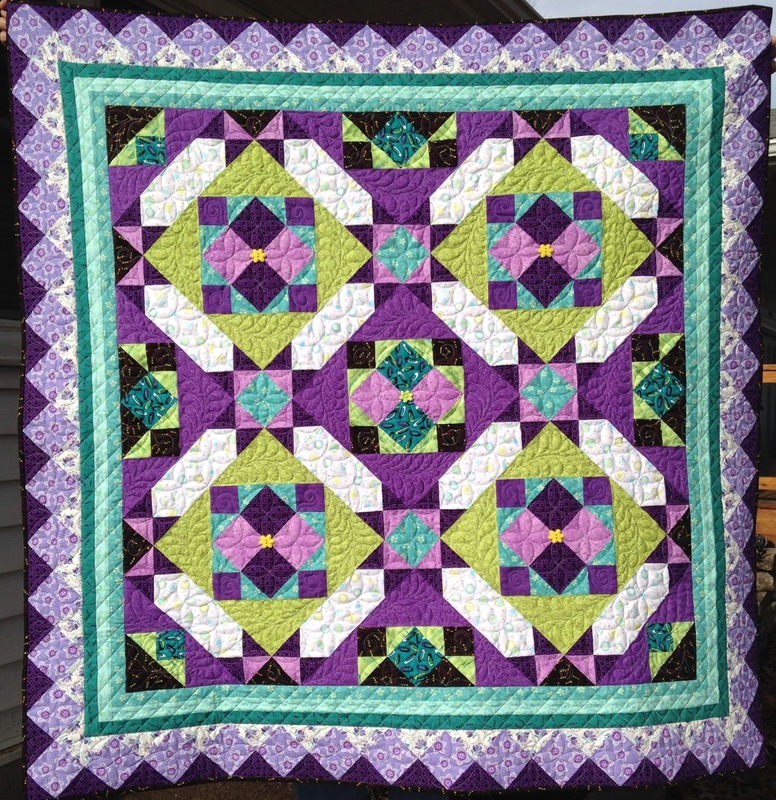 Besides I'm in love with colors and pattern of The Arboretum Stars quilt.